Cleaner fuels for cooking in India has always been a challenge, especially in rural areas where women have long been relying on more accessible and polluting sources. The health issues associated with their primitive technique has never been a matter of concern for neither their families nor themselves. Thus, the smoke from stoves igniting the family kitchen has been rolling on for what seems like forever. Indeed, it seems ironical that the Annapurna (deity of food) of the house, the woman herself, is putting her life on a ridge to feed her family using high polluting and life-threatening fuels. Albeit, the onset of cleaner fuels in the nation already occurred a while back, but rural areas still remained untouched by its usage. 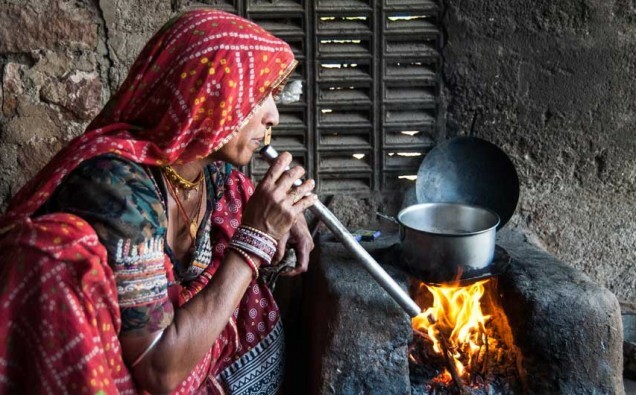 Considering the non-penetration of clean-cooking fuel and cooking stoves in rural areas, there has thus been a major chunk of the Indian population which abstained itself from using non-polluting fuels. The Government of India in 2016, started a flagship scheme to eliminate indoor environmental degradation and address health issues surrounding pollution from the use of kerosene, wood, cow-dung, and coal as cooking stove fuels. It instead encouraged the use of cleaner fuels such as LPG or induction. The movement of switching to clean cooking gas in the kitchen seems to be working. Indeed, the ‘Great Indian kitchen clean-up’ was initially started to reach out to below poverty line families, but in 2018 it extended to poor households across the country. The scheme attempts to popularise the use of modern cooking stoves amongst rural communities. This programme is presently underway in three states of India: Gujarat, Rajasthan and Uttar-Pradesh. Private entities and community trusts promoted by Tata Trust have been active and have sold bottled cooking gas to millions of rural household. Although, there may be a different side to the whole story. This campaign was started by BJP, the government currently under power in India which claims that is scheme is reducing the use of polluting household fuels. However, the oppositional Congress party differs from their claim and calls the scheme “half baked and structurally flawed”. The BJP shift to clean cooking gas does have its limitations as far as national schemes are concerned. Even though it has covered more than 60 million poor families with new LPG connections, as per data shows, there are still more than 100 million families who are using kerosene oil and other fuels for their home cooking. The Indian government is, in fact, paying gas suppliers for every free LPG connection they install in households and each connected houme can purchase its first LPG cylinder using an interest-free government loan. However, the families have to pay for all subsequent gas cylinders themselves after, which is still not affordable by the majority of families in India. Regardless of the scheme doing well at the initial stage, it failed to become a complete success, as a greater part of the country’s population could not bear the cost of cylinder refilling, which rose from 466 INR when the scheme was launched to 820 INR now. Thus, putting many households off the switch to safe and eco-friendly cooking fuel.